Digital Stirrup Bending Machine is used for producing stirrups and cutting to size bar using rebar of up to 13mm or double 13mm. It is equipped with wire inlet unit and offers all the advantages of latest technology and digital servomotors. The main features of this machine are the wide stainless steel front panel and the two servomotors on the driving unit which permit the machine to work at a maximum speed of 150 m/min. Digital Stirrup Bending Machine is also equipped with a stirrup collecting flap, wire inlet unit, anti twist device in the internal straightening unit and sapiens can produce a 200x200 mm stirrups in about two seconds which means, 4,000 stirrups per hour with double wire. 1) Pay off (FX 12B) : Adjustable pneumatic operated brake controlled by the machine's control board. Swinging roller holder with hardened steel, vertically adjusted rollers. May be connected in series with other pay-offs. 2) Control System : The control system of stirrup bender consists of PLC, HMI and feeding & bending servo motor. The main control method is: the operator edits graphics through the touch screen (HMI). 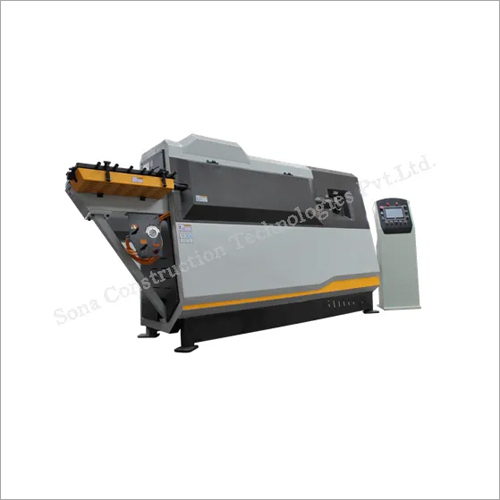 Including the length of each side and bending control servomotor through pulse and accordance with the specified size to auto complete steel processing. 3) Software Introduction : The entire system software is mainly composed of by the PLC program and HMI program. PLC program structure is divided into data calculation, logical judgments and actions performance. During steel processing, large amount of data calculation task mainly to the completion of the PLC.